The Jack Lalanne’s 100th Anniversary Fusion Juicer is still as contemporary and modern looking as ever and combines high performance with its simple functionality to make your juicing experience easier and quicker than ever. Thanks to patented extraction technology, nutrients don’t leech out while juicing. The adjustable and easy-to-use spout lets you make a mess-less glass of fresh, healthy juice. The best part is that the powerful motor, the stainless steel blade system and the large chute can handle just about any fruit or vegetable you want to juice. It’s not even necessary to cut, chop, peel or core the foods before you put them in. Toss in whole fruits and veggies without worrying about it! There are also two speeds so you can choose the amount of power you want to use. For example, you may want a slower speed for softer foods and a higher speed for harder foods. For people who are new to juicing or who just want some new ideas, the juicer comes with a juicing guide and recipe book to help you come up with new mixes. For the most part, this juicer is very user-friendly. You can put practically any fruit or veggie in to juice without worrying that it’s going to get jammed. You can also throw the food in there without having to cut, core or peel it beforehand. The spout makes it easy to pour the juice without making a mess. It holds a lot of juice, so you can get through several fruits and vegetables before having to pour out the juice to make more room. There are a lot of parts to disassemble for cleaning, but if you rinse everything off immediately following use, the pulp won’t get stuck. Put everything in the dishwasher to clean it thoroughly. Since the spout prevents drips and messes, the only thing to clean after use is the juicer itself. The juice is delicious and the juicer seems to use a lot of the fruits and veggies, more so than other juicers. You get a lot of juice out of the foods you put in. Since you can put in full fruits and veggies without cutting them or coring them, the juicer does the work for you and makes sure to leave in all the vital nutrients. Some people have claimed that they’ve had difficulty with the lock bar on top, but we haven’t come across that problem. The juicer works as it should, quickly juicing whatever we put in. The accompanying guide also explains the best way to use the juicer for maximum efficiency. As with most juicers, expect some noise when its making your juice. The juicer can be loud while in use, but that’s par for the course when it comes to juicers. Since it juices the foods so fast, it’s not loud for very long. This juicer gets quite a bit of juice out of the fruits and veggies. You get a lot of juice from the foods and the appliance can hold a lot of juice at one time, too. Like the guide says, you have to put soft fruits and veggies in first, followed by hard foods, if you want the juicer to work its best. The Jack Lalanne 100 year Anniversary SLH90 Juice Extractor is well-equipped and comes supplied with a really useful book called “The Ultimate Guide To Juicing” which will no doubt come in really handy with some starter recipes. Aside from the juicer itself, you also get a pitcher jug, extra large feeder and a micro mesh filter. This is a great juicer. It’s been around for years and has been proven to work well, especially thanks to the technology it uses to keep the nutrients in the juice instead of leaving them out, like other appliances do. All juicers are a bit difficult to assemble, disassemble and clean, but since this is dishwasher-safe, it’s not that difficult once you get the hang of it. The best part is that you can throw anything in to be juiced with minimal cutting and coring. 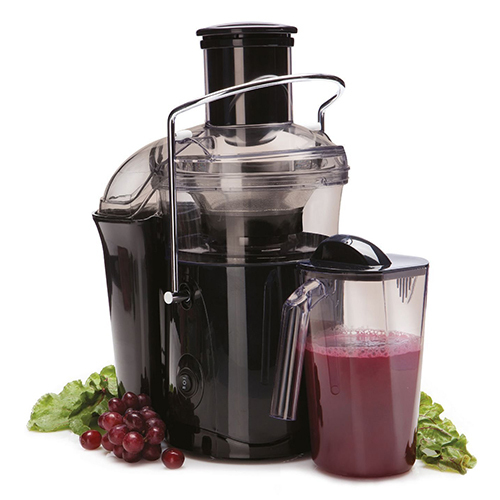 Overall, it’s a solid juicer that gets the job done fast.